Spectra Acquisition speed: 1 full spectra every 20 µs. Sample internal free volume: 1nl (1X10-6cc) to infinite volume. The sample gas from the device passes through a small transfer passage into the ionsource. As the sample gas passes by, ions of the gas are created. 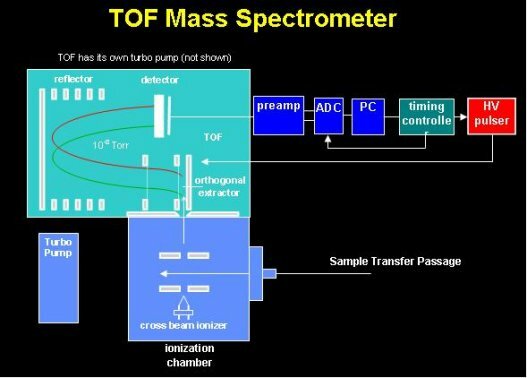 Every 20 µs, a packet of ions are extracted into the TOF by a high voltage pulse. The ions then traverse the flight path to the ion count detector. 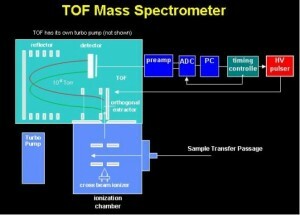 The time that it takes each ion to reach the detector is related to the mass-to-charge ratio. 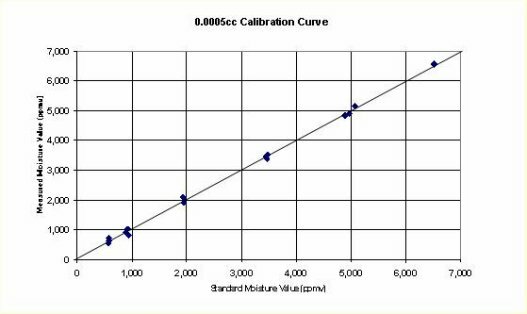 Ions reaching the detector are counted and saved in the PC at a 2 GHz sampling rate. Mass 14 from nitrogen, mass 16 from oxygen, mass 17 and 18 from water. 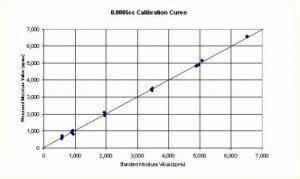 Moisture in nitrogen in a 0.0005 cc calibrator.